Find how a Chart Recorder works on this link. 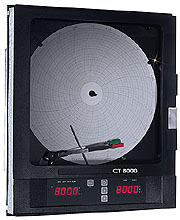 The CT8000 Series Circular Chart Recorder/Controller measures, displays and controls up to two process variables. Choose from a variety of programmable inputs. All recorder, control and alarm functions are easily configured via front key pad with self-prompting displays. Two user configurable alarm settings are provided for each pen. Optional control capability as well as RS-485 and NEMA-4X are available. Control outputs include SSR driver, 4 to 20 mA, or relays. In addition, the 4-20 mA option can be used for retransmitting the process value.